The mind can become its own slave. Kathy was obsessive compulsive. She had the careworn, joyless, exhausted but agitated look I’ve seen far too often. “I just have to swallow a certain number of times before leaving or entering the house”, she told me. Kathy looked as though she hadn’t really thought about that. Kathy was one of millions who suffer from obsessive compulsive disorder (OCD). Once the twisted tendrils of this condition take hold, they don’t let go – at least not without a fight. Practitioners can often feel stuck when treating this most malevolent of emotional conditions. But there are ways to help unravel the hold this condition has on our clients – and maybe even cure it. So what exactly are we dealing with when we seek to unhook obsessive compulsive disorder? The sufferer feels compelled to carry out rituals repeatedly – hand washing, clearing their throat, or washing their hands until they are red raw. The person may not be able to think about anything other than the ritualistic agenda. OCD makes people feel they have no choice, no volition but to cave to the demands of their obsessive preoccupations. What’s more, OCD seems to confer comforts, at least initially. Do this or that enough and a terrible fate can be averted. But, as with any repetitive behaviour, habituation gradually kicks in – and that means the more you do, the more you have to do. Fifty hand washes turns into seventy, turns into a hundred… and so on. But of course, while obsessions and compulsions are connected, and one often leads to the other, they are not quite the same thing. Many of us obsess occasionally. 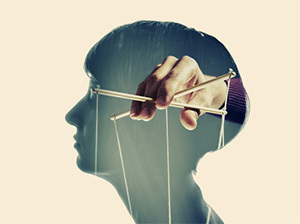 The extent to which we can relax about obsessive imaginings, stand aside from them, and let them fade (as mindfulness training teaches us) determines the likelihood that obsessive thoughts will morph into compulsive actions. And the extent to which we can check out the validity of the obsessive imagination (with the brain’s calm prefrontal neocortex) determines the extent that we actually buy into our own imaginings. Fear of harming another person, despite having no intention to do so. Interestingly, I have never known of anybody who obsessed about hurting others to actually do it. So, many of these thoughts do not turn into behavioural compulsions. Continually checking things, such as that doors are locked or that the oven is switched off. The important thing to consider on this last point is that checking doesn’t help because the evidence of the senses is overridden by the doubts engendered by the imagination. On the rock/paper/scissors level, imagination will always beat thoughts (in gaining and locking our attention) because it is aligned with emotion, and emotion demands attention. So why do people develop OCD? There certainly seem to be some innate personality traits that predispose to OCD, such as neuroticism (easily feeling negative emotion) and proneness to maladaptive perfectionism. But it’s also important to consider what needs OCD seems to meet for the person. Some people report feeling disassociated or ‘tranced out’ during times of obsessive ritual. They might report that an hour of hand washing seems like five minutes, or that their usual life just fades away during these times. When we enter trance we escape from our usual mode of consciousness. For some people their usual state of mind is not one they like very much. So the trance state of compulsive checking may be a way of escaping everyday life. But there’s another need that OCD may seem to promise to complete. As well as feeling safe, another vital human emotional need is to feel we have some control over our lives. OCD often starts with the concept “If I do this, then that will (or won’t) happen!” Disasters can be averted and catastrophes avoided. Destiny can be controlled. But of course, after a time the obsessive compulsions start to control the person who has them. We may all have the occasional obsessive thought or action, but when people are in the throes of OCD their whole life can start to centre on its tyrannical, unreasonable, whip-cracking agenda. But there’s something else we need to understand about OCD. Obsessive compulsive disorder isn’t a thinking disorder – it’s a feeling disorder. The feelings produce the thoughts, not the other way around. This isn’t to say that cognitive behavioural therapy for OCD is useless. Catching thoughts and challenging them, and of course deliberately changing behaviour, can disrupt the pattern of OCD and make it easier to learn how not to succumb to it. And I wouldn’t be offering my favorite CBT techniques for the condition if I didn’t feel CBT held some value for the treatment of OCD. But any cognitive approach must be part of a wider understanding of how emotions drive human beings. The old thought-produces-feeling idea is dead in the water when it comes to really strong feelings. We need to look at the role not just of thoughts but of the imagination when it comes to any emotional condition. Recent research found that not only are obsessive compulsives disassociated from reality during the trance of obsessionality (and therefore not necessarily thinking at all), but they also rely heavily on their imagination as a guide to reality. This tendency to mix fantasy with reality, known as ‘inferential confusion’, makes a person believe their fantasy over immediate perceptions of reality. So they may see that their hands are clean, but imagine they are contaminated. Once we stop taking our cues from observable reality, we become prey to our own imaginations. The imagination is a major player in the formation and maintenance of OCD, above and beyond beliefs and mood states. The obsessive doesn’t think their hands are contaminated, but they feel as if they are. This is an important distinction and shows us why just trying to deal with the thinking part of an emotional difficutly can be slow, laborious, and ineffective. If I imagine the plane I’m about to take off in is going to crash, I may not think it will, but I might feel it will. We need to calm down feelings before we can challenge thoughts. This is why all CBT therapists need to know how to calm feelings. As long as the pool of water is still churning, there can be no clear reflection. OCD is a disorder of the imagination. So, since clinical hypnosis is a useful way of accessing and helping people learn to control the imagination, increasing numbers of practitioners are using this therapeutic tool as part of OCD treatment. Hypnosis can be a hugely powerful way of treating OCD because, essentially, the condition itself is hypnotic. People with OCD can be seen as phobic of not carrying out a ritual. If we can help them relax deeply as they imagine, say, washing their hands not 100 times but only once, we can help them relax with moving away from the prop of the ritual (which is really a stick to beat themselves!). Sometimes I will use the Rewind Technique, a method usually used for the quick and comfortable resolution of phobias and PTSD. Once we assuage the anxiety, we can look at helping our clients gain a sense of greater control in their lives. It’s at that point in treatment that we can start to address thoughts and behaviours. So with all that in mind, here are my three favorite CBT techniques for obsessive compulsive disorder. Stop and focus on what is happening. Ask the OCD what it is trying to do for you right now. Listen to what it’s trying to do for you (such as trying to make you feel safe or in control). Think of three ways you could feel safer or more in control outside of the OCD, and write them down. For example, if we have taught the client a breathing technique for fast relaxation or self-hypnosis, these are other ways they can relax. To relax is really just to feel safe. We can also look at how they can meet their basic emotional needs in more healthy ways generally, so that the raison d’être of the OCD starts to fall away. Because OCD drives people to misuse their imaginations and then prejudicially prioritize fantasy over observable reality, it can be useful to help people focus on the here and now. One exercise I sometimes do with people experiencing OCD is to have them close their eyes, tell them I’m going to clap, and ask them to tell me when I have actually clapped and when (between real claps) they have imagined I’ve clapped. I have never had anyone be unable to distinguish the real claps from the imagined sounds. This exercise builds the client’s confidence in trusting their senses over their imaginings. Then I will have them relax deeply and envisage typical times that the OCD tries to impose its will (because it’s not really their will) and find they can trust their eyes to know that the door is locked, or that their hands are clean… enough! We can ask them to focus on three things they can actually see – say, a door, a window, and another person. They can then run through in their mind three things about the door (it’s yellow, it’s locked, it’s about 7 feet high), three things about the window, and so on. This is a distraction technique, yes, but it’s also a way of moving from imagination to observation. The more calmly the person can rehearse doing this in their mind, the easier it will be when the OCD tries it on with them. This brings me to the last technique. Yes, it’s a cliché to say “You are not the OCD”, but that doesn’t mean it’s not important. We want our clients to use this knowledge to overcome the condition. This is the opposite to labelling someone. More than that, it’s a way of peeling off that label. What arguments does it use to try to convince you to exhaust yourself and waste your time? What are all the persuasion techniques it uses? What does it seem to promise you? What lies does it tell you? Removing the condition from the client’s core identity is a key skill of any practitioner. It’s also how we treat chronic smokers and other people wedded to pernicious addictions. Remember Kathy from the start of this piece? She told me that the OCD promised her that swallowing over and over would keep her safe. That checking over and over would give her surety. She described how the OCD lied and convinced her, and as she did I could almost see it loosening its grip on her, as she increasingly saw it as an impostor – not who she really was at all. A charming and convincing conniver, a parasite living off her real self. I taught Kathy to become aware of it as something that was trying it on with her. Each time she felt tempted to jump at the OCD’s command, she would start to question it. And she found it quickly lost its power. Externalization as a psychotherapeutic technique is as old as the hills. It’s why we have stories that externalize patterns in the human psyche, laying them bare in seemingly disparate characters who are, in a sense, simply different aspects of the mind of the reader. Teach the client to spot the underlying need the OCD was promising to meet and generate alternative and healthy ways to meet that need. Teach them to focus on and trust the observable reality of their senses over fantasy. Help them externalize the OCD and therefore more easily detach from it. Kathy told me in her last session that she no longer had to swallow compulsively, spend hours checking her door was locked, or submit to any of the other compulsions that had been draining her precious life. And you can help clients move past their phobias associated with OCD with the Rewind Technique online course. Click here to learn more and sign up to be notified when booking is open.